Part three of our epic cherry blossom list shows you the bloom of the Kansai region, featuring Osaka and the big cheese, Kyoto. 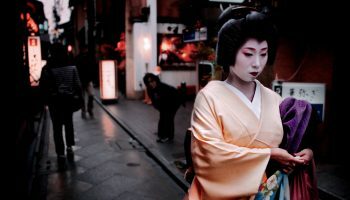 The Kansai region is where you’ll find the traditional Japan of your travel fantasies; winding cobbled streets lined with dark wooden houses, the sound of distant gongs in the mountains and – for a limited time only – cherry blossoms. Blossom estimate based on the latest prediction. To celebrate the completion of Shichikawa Dam in 1956, residents planted around 3,000 cherry trees in the area. The vivid pink blossoms set against a backdrop of the blue lake and green mountains are a watercolorist’s dream. Once a very powerful temple during the Sengoku (Warring States) period led by priest soldiers called Negoro-shu, much of the complex was burnt down in a decisive battle bar a few temple towers. Good news: the temple was restored in Edo era so you can now have a peaceful hanami under the 7000 or so sakura. Constructed by a Buddhist priest called Ikou in 770, who came straight from Tang Dynasty’s China, the sakura trees at this picturesque temple are famous for blooming earlier than other places in Kansai. Don’t miss the Hiokayama Burial Mounds within the park, comprising five different burial mounds that are distinctive in their shape: square at the front and rounded in the rear. In spring, roughly 1,500 sakura trees bloom in the area, and are lit up during the night. The huge park is also equipped with an athletic field, baseball field, pool as well as a sports center just in case you were feeling athletic. 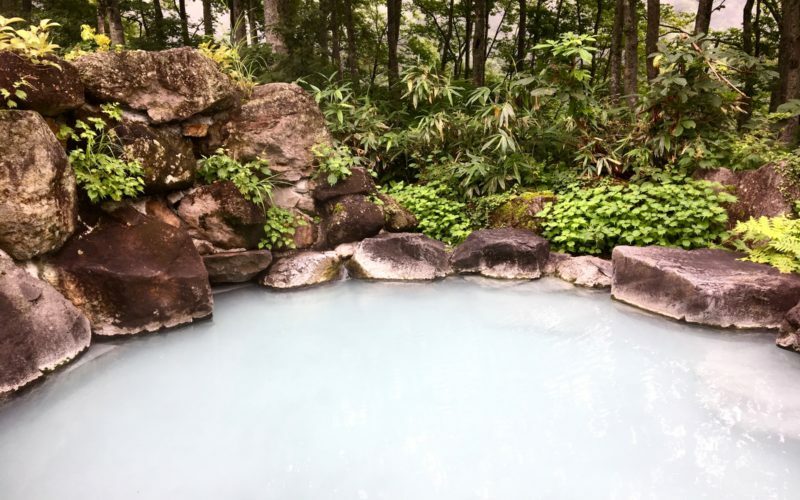 1,000 sakura blossom on both sides of Shukugawa River for more than two breathtaking kilometers. 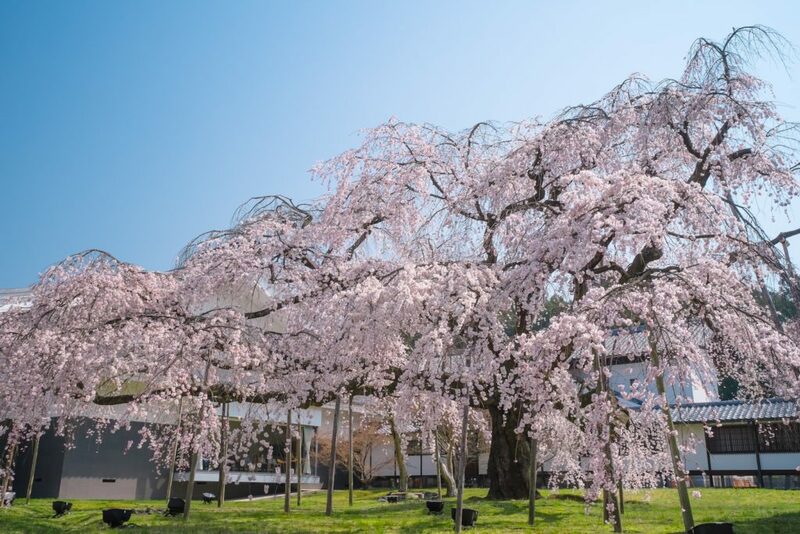 They were planted by then-mayor Uichirou Tatsuuma in 1949 – he gets our vote. With the Akashi Castle ruins at the center, this huge park is full of different types of trees and plants despite being smack bang in the city center. Hanami to your heart’s content under the approximately 1,000 sakura trees. A UNESCO World Heritage site and one of Japan’s most beautiful castles, Himeji Castle was recently repainted making the pink cherry blossoms look even more vivid against the bright white (Himeji is also known as the “White Heron.”) DO. NOT. MISS. the stunning view of the 1,000 sakura trees inside the inner moat, as well as the blossom around Sannomaru Square and through Nishinomaru Garden. At the weird and wonderful Expo ‘70 Commemorative Park, you can see a total of approx. 5,500 sakura trees’ blossom take up residence along Higashioji-dori Street. During the festival period, the cherry blossoms are beautifully lit up after sunset. Train: 5 min walk from Osaka Monorail Expo ‘70 Commemorative Park Station. Osaka Castle is located at the center of this sprawling park, well-known as an oasis in the heart of bustling Osaka. 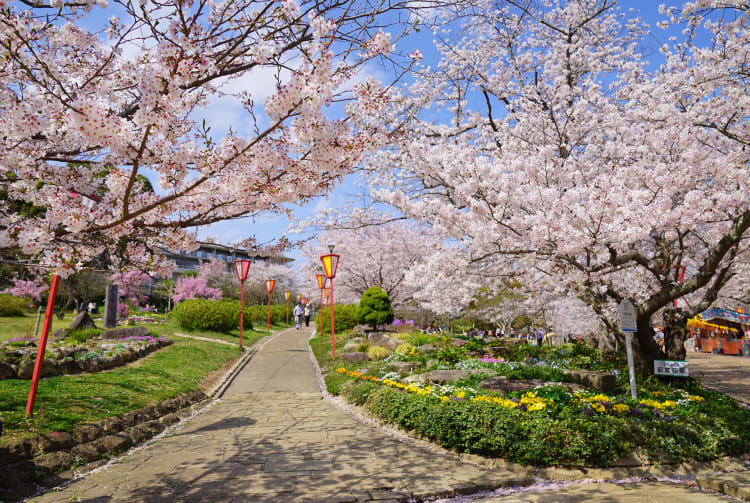 Nishinomaru Teien Garden will be filled with some 300 trees’ pink cherry blossoms, along with the last flowering of 1,270 plum trees at Osaka Castle Park. The cherry blossom tunnel inside the Mint Bureau area continues for 560 meters of beautiful blossoms. 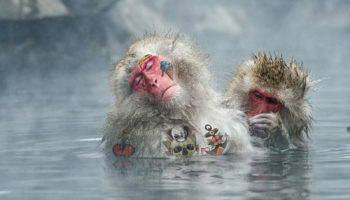 You can hanami in the company of around 130 types of sakura, including some rare types such as ootemari and kodemari. During this period, there will be traffic control around the Mint Bureau and you’ll be asked to refrain from using the parking lot. The use of public transportation is recommended. Around 300,000 people are expected at the castle festival, which is held from the end of March until the beginning of April. 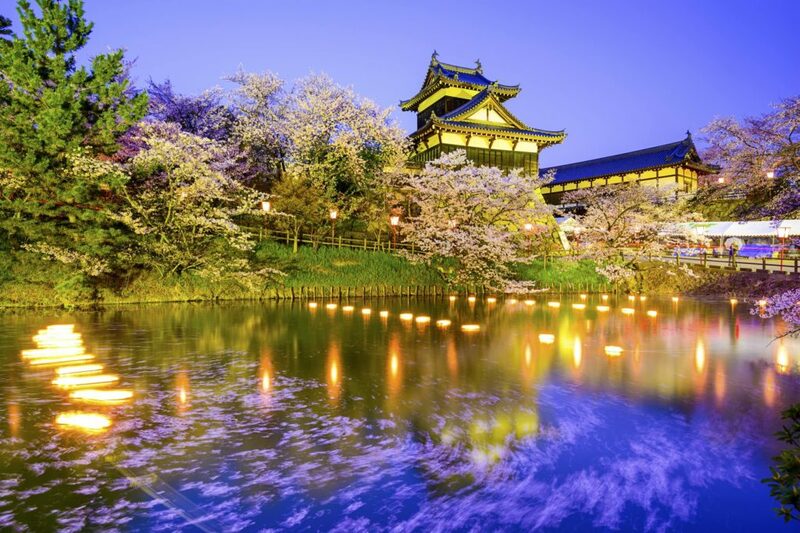 At Koriyama Castle, 600 lanterns will be lit up to enhance the beauty of sakura while you browse the many food stalls. Well-known for being a place where you can play with – or run away from – cracker-loving deer (as well as for the awe-inspiring Daibutsu), this enormous park boasts various types of sakura trees all blossoming at different times until the end of April. More than 800 ancient sakura trees bloom together to create a four-kilometer-long sakura tunnel that hangs over Biwa Lake in a stunning cherry blossom showcase. All we can say is props to whoever planted those trees. Train: 5 min walk from Kaizu Ikku bus station after taking a Makino Town Bus from HR Makino Station. Located near Biwa Lake, the area around Nagahama Castle boasts more than 700 sakura trees which look especially pretty from the top of the castle tower, or viewed from the bottom looking up at the traditional structure. Also from the entrance to the castle grounds, they look beautiful, too. O.K., yeah, they look good from any angle. Unchanged since the Edo era, this place offers a classic view of sakura with the five-storied pagoda in the background. But the blooms in front of the main hall of the temple, as well as in front of the bell tower do give the famous scene a run for its money. The forest of two-meter-tall omurozakura, which blossoms at the end of the sakura season in Kyoto, is particularly striking. This is also one of our Top 10 places to see sakura in Kyoto! The weeping cherry blossoms of Daigo-ji Temple. Daigo-ji is named after Daigo no Hanami, a decadent hanami party held by samurai ruler Toyotomi Hideyoshi. Make like the military general and enjoy the 800 sakura trees in the scenic temple gardens lasting about three weeks from the end of March till the beginning of April. This is also one of our Top 10 places to see sakura in Kyoto! During the sakura season, the entire Arashiyama mountain gets covered in a glorious pink cherry blossom carpet becoming even more photogenic than usual. For the best view, head to Togetsukyo Bridge from where the scene is almost too Japan to be true. Climb the 289-meter-high Kasagiyama, exploring the historical ruins of Buddha statues dispersed through the mountain along the way. Cherry blossom lines Kizugawa River at the base of the mountain. There are also a lot of sakura trees around JR Kasagi Station which makes you feel like you’re riding through a sakura tunnel on the train.